Great location, beds a little hard for me but they have a pad that they will add to the bed if you ask. Staff very friendly and helpful. Had a very hard time sleeping at night. We kept hearing a noise from an animal and we weren't sure what it was. It sounded like it was inside our room at night. Later during the day we heard it and we searched couldn't find anything in our room. Then we realized it was moving but only movie with inside the walls! Had to sleep with earplugs the whole time. Our last day leaving we heard the sound outside the lobby and looked up the ceiling and saw this smal little lizard looking animal making the voluminous sound!!! They must be all around the building. So beware staying here if you're a light sleeper, your sleep will be disturbed! Thank goodness for earplugs! Excellent Hotel at very good price. Wonderful views, rooms, pools, nearest beach, etc. I feel we made a good choice. Staff had great aloha spirit and we felt well treated. Hotel was nice. Not five star but great for a short stay in Phuket. Lots of stairs, which in the humidity is hard. Breakfast buffet was really good. This hotel was absolutely amazing! I am more than pleased with everything - from service to wifi and the location. Kata beach has been my favourite so far in my Phuket travels and this hotel was in the perfect spot. Right across the streeet from the beach, markets, massages and convenience stores. It was absolutely wonderful. I had the sea view room; we loved it. We saw the beautiful beach from our room. I recommend this to all honeymooners. The hotel is also ideal for families with kids which they have outdoor pools for the kids. If this is your first time in Phuket, I recommended visiting this place for at least a week. If money is tight, enjoy this resort together for a couple of days and reserve a low-end hotel and book tours later during the week. If you need somewhere cheap to sleep, then yes. The inside needs major remodeling, esp the bathroom. No AC in the elevators. Took 3 elevators to get to our room. 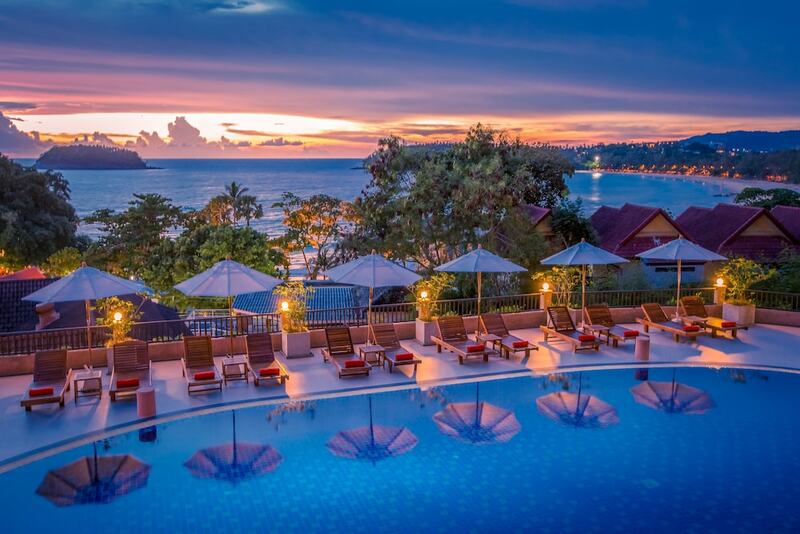 Chanalai Garden Resort, Kata Beach places you next to Kata Beach and within a 10-minute stroll of other popular attractions like Kata Noi Beach. This 206-room, 4-star hotel has an outdoor pool along with a health club and a conference center. Enjoy a bite to eat at Morakot Restaurant, the hotel's onsite restaurant. Savor a meal from the comfort of your room with room service. Buffet breakfast is offered for a fee each morning from 7:00 AM to 10:00 AM. Guests can expect to find a flat-screen TV with cable channels. Beds sport premium bedding and the bathroom offers a soaking tub and free toiletries. Other standard amenities include a coffee maker, free bottled water, and a phone. At Chanalai Garden Resort, Kata Beach, guests enjoy an outdoor pool, a health club, and free WiFi in public areas. The 24-hour front desk has staff standing by to help with tours/tickets and securing valuables. Additional amenities include a conference center, a business center, and express check-in. sea view was the best view! nice hotel close to the beach. Buffet breakfast is served daily from 7:00 AM to 10:00 AM for a fee. Morakot Restaurant - Restaurant specializing in international cuisine. Open daily for breakfast, lunch, and dinner. Spice Trail - Restaurant open daily for lunch and dinner. Recreation features at Chanalai Garden Resort, Kata Beach include an outdoor pool and a health club. The preferred airport is Phuket (HKT-Phuket Intl. ): 42-min drive, 28.4 mi/45.7 km.